The event overall was well organised, with parking very close to both transition start and finish line. Transition was on grass, short, and with enough space to comfortably move around during the race. The organisers cared for spectators too, granting a stress-free race viewing experience with good and practical services around the transition area, and an easy to follow swim & run. We also loved the large playground for the young ones! Feed stations did the job quite well and the atmosphere at the finish line was great! The day before race day a big windy rain scared all the athletes that went onsite for the registration procedure, but thank goodness on race day the weather was kind, and a shiny sun made it great and softened the tough cold water. The cold 12 degrees freshwater and murky green swim course was reduced to 1x 950m lap instead of 2. The relatively short course combined with the rolling start – you always meet the “smart” slow swimmers who want to be in the front pack…- made the swim very busy therefore slower. Many athletes used neoprene swim cap but the sun helped the racers to get through the swim leg with not too many difficulties. Maaan it was cold & green indeed! The course was 1 loop with c. 580mt elevation gain, on open roads (with very few cars though). Enjoyable landscapes, directions were easy to follow, plenty of marshals and 2 feed stations at k 33 and 67 completed a well organised bike leg. Definitely not the fastest bike course, with a series of nice rolling hills and some flat stretches with a light side wind. The shortened swim course caused many triathletes getting out of T1 in a short time range and this made a busy bike leg with quite few groups. Most likely some drafting has happened. The run was quite interesting, a 2 loop course with a mix of grass, tarmac and trail with 120m elevation gain! Technical run, and relatively slow but it was fun and the diversified landscape throughout the course made it more interesting. Few holes in the grass section as well as a short muddy descent in the trail part increased the difficulty, but nothing to be scared of. Niccolò Ragnoli – The exemplary tough guy. Few people in the circuit know how hard it is for Niccolo' to train while pursuing a very successful career in investment banking and looking after his multiple vices. On top of it, he hates cold water, he doesn't like to be stressed out early in the morning, and struggles to pay the necessary attention to his gear; all those are not recommended traits for a triathlete. But he never gives up. Ever. He could finish a middle distance race showing up in the morning straight from a Mayfair club, and he always looks the coolest in pictures. The Immortal. Carmine Tavano – Impressive developments for Carmine in this first race of the season. He truly loves the sport in his anxious theatrical way and this keeps pushing him further and further. He has been training hard in the winter season and has spent hard earned pounds on a new speed machine. He got overtaken by Alex Ferrario on the last mile and we all know what a high class athlete is Alex. We would also congratulate Carmine for completing the bike leg wearing what looked like a Moncler down jacket on top of his Castelli tri top. The Aunty. Alex Ferrario – He is a tough beast. Definitely doesn't like to swim in cold waters (who does? ), got nervous and lost time. Had mechanical troubles on the bike and a hurting back, but he's always there holding tight. Started the half marathon and progressively improved pace, and you could see his perfect running form from distance. He finished pushing impressive 4.15m/k paces and overtook The Aunty at the final km. Experienced. Marcello Salemi (right hand side in pic below) – A real star, and probably the CAMA athlete with the hottest body among us all (sorry guys but it's true). He doesn't have a TT which is costing him on these roads, but we are sure he will soon splash some cash. He is a fabulous swimmer but swimming in these waters was impossible. Great running form, he ran next to Marcello Ferrari for the all course and tossed him away at the very end losing by 1 minute on the overall timing (we might use some references going forward). He could have taken off earlier we think, but he cares about friends more than timing, and that is what makes him a special team member beyond anything else. Sicilian Stallion. Marcello Ferrari (left hand side in pic below) – If we had to use one word to describe him, we would go for 'focus'. if we needed two, we would go for 'focus' and 'cashmere'. He shows up with plenty of carbon fiber objects, fancy gadgets, and a family support wrapped in soft cashmere (designed in house!). He swims smart, rides smart, and runs hard. Everything according to plan, a real execution guy. He is humble, and remains always focused on the mantra that 'execution is more important than the outcome'. We think we have a monster athlete with a lot of untapped potential here, and we will see more of it on the big field soon in Roth if the Mechanical God helps him. The Manager. Alexey Ermolenko (in the pic below with Luca) – They call him the Russian Machine, but we prefer Crazy Horse. And he's faithful to his name. He starts the swim positioning himself at the front of the pack, he goes out riding with pedals not properly working and after few kms he approaches number 66 with the simple request 'Man, do you have an Allen Key? I need it.' He solves his issue on the go, keeps riding hard, and hits the pavement hard with his feet for the run for a sub 1h30m half marathon. You could spot his Mother Russia trisuit from far away, and we all might have seen too many Rocky movies, but it's a fact that a Russian blonde big boy running at 4.15m/k pace chasing the pack has an impact. Our Vladimir Brownlee. Luca Prosperi – A renovated flashy Luca, wearing tacky 100% sunglasses “PetoSagan” style, a notorious Batman baseball cap for the run, and a good-luck-opening-season-tash besides a visibly longer hairstyle. 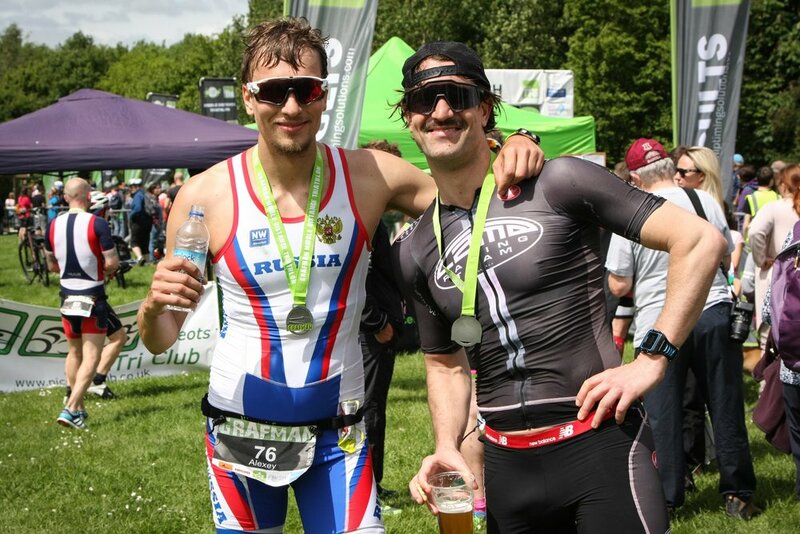 Luca performed unsurprisingly well, ranked 14th overall and 5th AG, despite his conservative swim and bike legs. He tested what he wanted to test: a punchy half marathon after a conservative, albeit still fast, bike leg. His swim was slow compared to what we are used to see on his splits, but the shortened course was very busy. Surely he could have swam at least 2-3 minutes faster than what he did but this was not the goal of the day... A respectable 2h31 bike leg was a solid but conservative performance. He decided to hold back to give it all in the run: the result was a brilliant and fast run on a relatively slow course for a 1h24m half marathon. LVCVS. On behalf of all the CAMA racers, a big thank you to “Mario the Chairman”, Teia and Athena, our mascot, who come all the way to Grafham Water to take pictures and support the racers. Mario, for the occasion, gained a new nickname: “Mario La Pellicola (film)” due to his dedication to photography.